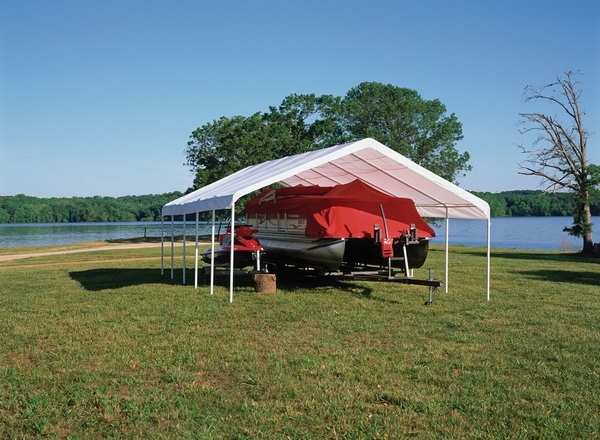 Protect your vehicles, boats, or equipment with this extremely durable shelter. Frames are secured with beam welded 2" diameter poles, and undergo a 13-step Rhino Shield surface preparation process, which results in a frame that has been field tested to endure almost any but the most extreme weather. DuPont thermoset finishing prevents rust, weathering, chipping, and peeling. Twist-Tite technology snugs the canopy securely into place, and the Easy-Slide Cross Rail system clamps down to keep frame square and locked into place. Vinyl canopy is a triple-layer, heat bonded single piece that is 100% waterproof and is treated to protect against UV, fading, and rot. Do they make longer legs for this canopy? I need at least 10 ft legs to fit my motor home. No, it only comes as described. They do not make longer legs or take special orders. Our RV is 11'2" tall I know this unit is 11' is that at the peak. How tall are the sides? This canopy is 6'3 at the sides. Please give us all three dimensions for your RV and we will do our best to find the right product for you. Are side panels and end panels available for this tent? Do you have end panels with zippered doors? 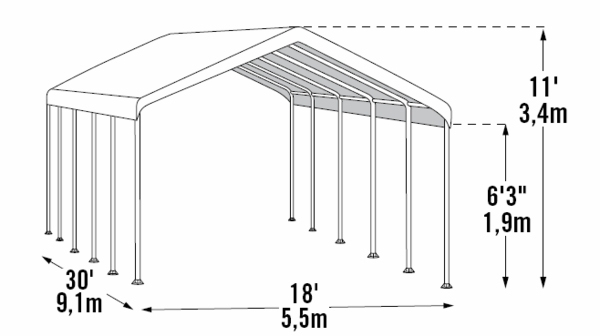 About how many inches of snow can this canopy shelter support, assuming it has been properly assembled and anchored per instructions? What is the estimated shipping time (time in transit) to a 20171 Zip code from the warehouse? This shelter is not snow load rated. For a complete list of our snow load rated shelters, please search keyword "snow". Then click "canopies" on the left side of the screen. You may obtain the estimted ship time for each by entering your ZIP code on each item page. Canopy ripped and frayed in less then a year. ProsWent together pretty easily. like the carriage bolts on legs. ConsNeeds carriage bolts in roofing frame to keep pressure off canopy from holding frame together in winds. Canopy needs to be a little longer to better overlap frame. Corners of canopy need more secure anchoring to frame. Bungies used to secure canopy to frame don't last. We are really pleased with this purchase. Its strong, easyt to errect, and portable. Elite was great to work with and prompt on delivery.